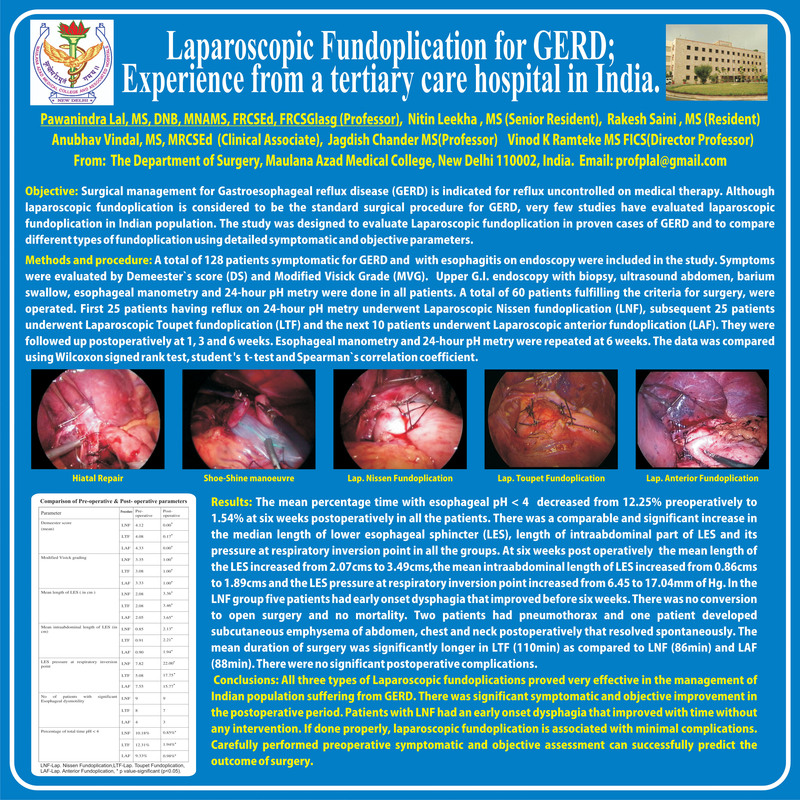 Laparoscopic Fundoplication for Gerd; Experience From a Tertiary Care Hospital in India. Objective: Surgical management for Gastroesophageal reflux disease (GERD) is indicated for reflux uncontrolled on medical therapy. Although laparoscopic fundoplication is considered to be the standard surgical procedure for GERD, very few studies have evaluated laparoscopic fundoplication in Indian population. The study was designed to evaluate Laparoscopic fundoplication in proven cases of GERD and to compare different types of fundoplication using detailed symptomatic and objective parameters. Method and procedure: A total of 128 patients symptomatic for GERD and with esophagitis on endoscopy were included in the study. Symptoms were evaluated by Demeester`s score (DS) and Modified Visick Grade (MVG). Upper G.I.Endoscopy with biopsy, ultrasound abdomen, Barium swallow, esophageal manometry and 24-hour pH metry were done in all patients. A total of 60 patients fulfilling the criteria for surgery, were operated. First 25 patients having reflux on 24-hour pH metry underwent Laparoscopic Nissen fundoplication (LNF), subsequent 25 patients underwent Laparoscopic Toupet fundoplication (LTF) and the next 10 patients underwent Laparoscopic anterior fundoplication (LAF). They were followed up postoperatively at 1, 3 and 6 weeks. Esophageal manometry and 24-hour pH metry were repeated at 6 weeks. The data was compared using Wilcoxon signed rank test, student t test and Spearman`s correlation coefficient. Results: The mean percentage time with esophageal pH < 4 decreased to less than four percent in all patients, it decreased from 12.25% preoperatively to 1.54% at six weeks postoperatively. There was a comparable and significant increase in the median length of lower esophageal sphincter (LES), length of intraabdominal part of LES and its pressure at respiratory inversion point in all the groups. At six weeks post operative the mean length of the LES increased from 2.07cms to 3.49cms,the mean intraabdominal length of LES increased from 0.86cms to 1.89cms and the LES pressure at respiratory inversion point increased from 6.45 to 17.04mm of Hg. In the LNF group five patients had early onset dysphagia that improved before six weeks. There was no conversion to open surgery and no mortality. Two patients had pneumothorax and one patient developed subcutaneous emphysema of abdomen, chest and neck postoperatively that resolved spontaneously. The mean duration of surgery was significantly longer in LTF (110min) as compared to LNF (86min) and LAF (88min). There were no significant postoperative complications. Conclusions: All three types of Laparoscopic fundoplication proved very effective in the management of Indian population suffering from GERD. There was significant symptomatic and objective improvement in the postoperative period. Patients with LNF had an early onset dysphagia that improved with time without any intervention. If done properly, laparoscopic fundoplication is associated with minimal complications. Carefully performed preoperative symptomatic and objective assessment can successfully predict the outcome of surgery.